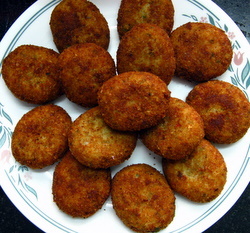 This Fish Cutlet recipe is among some delicious and easy to make Indian fish recipes. The type of fish you use to make these cutlets is entirely up to you. Any fish with a single center bone, would be a nice option. Simply because it is easier to clean. Having said that, I have tried this recipe even with Indian mackerel, which has quite a few small bones. It is difficult or rather time consuming to take out all the bones but it is worth the effort as the flavor of the cutlets comes very tasty. So, ready for the Indian fish cakes recipe? Add the fish and water in a saucepan. Crush the ginger and garlic a little. Add this and the peppercorns, along with the fennel seeds in the pan and let it boil, till the fish gets cooked (which will take about 4-5 minutes). Turn off the heat and cover with a lid. Let it cool down, while the flavors get infused. Now that you know all the ingredients, there is no rocket science involved in making the cutlets. Only a few precautions that will help you make good cutlets. Take out the boiled fish steak or fish slices and place on a strainer. Let the water get completely drained out. Now remove the skin and bones, if any. Place the bones fish in a bowl and mash with your fingers. We do not want any extra water in the cutlet mixture, so take precautions, even with the potatoes. Potatoes have a tendency to absorb water. Which can make your mixture sticky. To avoid this, always boil the whole potato with the skin on. I always do this using a pressure cooker. It is very simple. Just add the whole potatoes. Pour water to cover them and pressure cook until done. If the pressure cooker is large then they will be done by the first whistle. Don't leave the potatoes lying in the boiled water. Once you open the pressure cooker, drain the potatoes and leave to cool. Now peel and grate or mash the potatoes. Add this to the fish and also add all the rest of the ingredients (except the one mentioned under coating). Mash well using you hands. Taste and check the salt and chili. Adjust the seasoning if required. Next comes the shaping. You can shape them as you want. I usually make even oval shapes. Simply take a little mixture and shape it in the form of a ball. Then gently press it between your palms to make it flat. Ready for coating? Put the bread crumbs in a bowl or flat plate. In a separate bowl beat an egg with a little salt. Now pick each fish cutlet and first dip in egg and roll it in the bread crumbs. Place on a flat tray. Once all the coating is done, it is essential that the coating gets stuck nicely. To ensure that, place the fish cutlets inside the refrigerator for half an hour. Heat oil in a kadai. Slip in one cutlet at first, just to check that it doesn't break. Don't worry, it won't. Just don't turn them over immediately after putting in oil. Turn them over only after some time. This way they won't crack or break. But it is a good practice to fry just one first. In case you put 5 and they all break, imagine the mess in the oil. Deep fry till golden brown. Drain on paper and serve hot with some chutney, sauce or dips. Here are some chutney recipes to go with the fish cutlet. To freeze the cutlets, let them come to room temperature, then put in a freezer box. To serve later, you need to thaw them completely, then reheat in the oven or on a tawa, no need to deep fry.